Your ride is getting bumpier and rougher. Your vehicle squeals or pulls when you are making turns. The tread on your tires is wearing unevenly. If you slam the brakes, your vehicle tips forward, or nosedives. Your vehicle doesn’t sit level and you can see one corner is higher or lower than the others. You notice bumps and swerves even traveling at very low speeds, such as going over a speed bump. To properly inspect a suspension system, mechanics or technicians will visually inspect the strut mounts and shock towers that you can find under the hood over each wheel. The strut mounts should be sturdy and secure, not rusty, or loose. Our team also will check the height of your car near all four wheels. The height shouldn’t vary more than ½ inch. If it does, the lower sitting side is an indicator of where a suspension problem might lie. When your car is raised overhead, the inspection will move to the rubber bushings that separate metal suspension components from each other. We will check for any wear that allows too much give between parts, which can cause swaying and wobbles when you are driving. 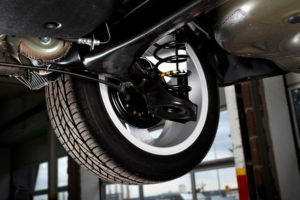 Another part of this inspection will include checking for play in the tie rods, which connect the steering system to the wheels. We will repeat this inspection process for the rear suspension system as well.